continues to make top quality tools for the stone carver. The female quick-connect fitting is attached to the discharge end of incoming supply hose. Note the in-line air valve fitted to the small finishing hammer (at left) which allows minute adjustments of the air feed for greater control. tool and strikes the end of the chisel. less than a hammer designed for stonecarving. modifications from straight flat chisels. 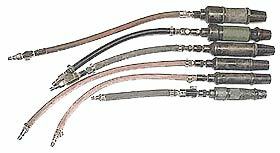 Though a main shut-off valves should be attached to the compressor, the installation of quick-connect fittings on the in-line supply valve (as on the example shown at right) allows a greater flexibility when interchanging hoses and different tools on the same supply line. Though not an essential fitting, swiveling-elbow joints like this allow the carver a much greater degree of freedom of movement while attached to the sometimes heavy and awkward rubber supply hose from the compressor. This example has both male and female quick-connects fitted so it can be used or removed easily as needed. 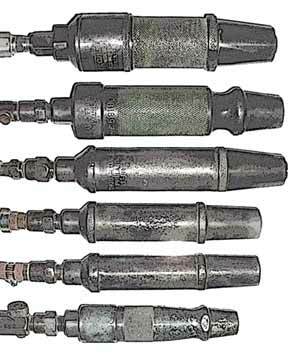 The pneumatic hammer comes in several sizes and types, the most common of which accepts chisels with a 1/2" diameter shank. 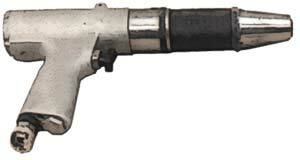 The size and type of hammer is varied to accommodate the needs of the carver and type of work being performed. The larger of the two hammers at left is used primarily for roughing-out work on harder varieties or larger blocks of stone, while the smaller 'short-stroke' hammer at left allows a much greater degree of control for the carver in the later stages of work when carving finishing details. on the balance and weight in the user's hands. 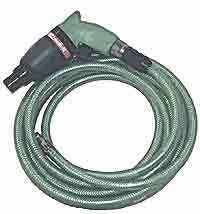 The air compressor and the rubber supply hoses should have quick-connect fittings at both the supply and discharge ends of the hose. The quick-connects allow the various air driven tools to be switched easily as the work requires. 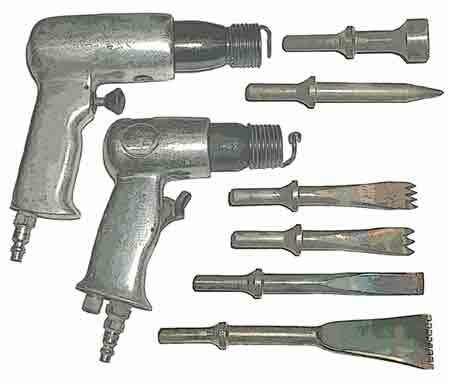 Pneumatic hammers are difficult to wear-out — four of the six hammers below were bought secondhand from carver's who told me they bought them in the1920s and '30s. These old hammers work almost as well as the Trow and Holden and Cuturi hammers purchased new in 1991. 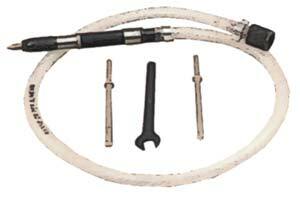 The corresponding male quick-connect fitting at the end of the whip attached to the intake on the pneumatic tool, or to the intake end of a supply hose. 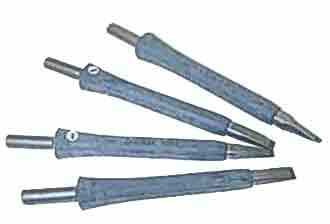 The air hammers should be attached to a short length of rubber air hose (called a whip) to prevent the hammer vibrations from damaging the quick-connect fittings. The exact length of the whip should provide an easily accessible and comfortable location for the connections and in-line air control valve while working. To the novice carver these hammers are very appealing for a couple of reasons — the relatively low initial expense and the familiar switch and grip style similar to an electric drill. But I have found that if the carving student has the option of becoming familiar with both styles of hammer, it is usually this pistol-grip type of hammer that is discarded in favor of the regular stone carving style hammer. Though these pistol-grip hammers are certainly serviceable, for my own work it comes down to the greater degree of control afforded by the loose socket and the generally longer shank-length of the chisels made to fit those regular stone carving hammers. And finally, for the carver who wants both the versatility of the loose socket Carving Hammer and the pistol grip style, an Italian design combines both into one tool. The one pictured (at left) is comparable in size and power to the mid-size hammer (3.2 lb. Dallet), though it weighs a bit more because of the handle. 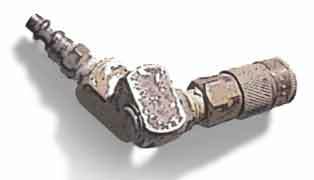 NOTE: hammer is shown with the typical Italian-style of quick-connect which joins by a screw-twist method rather than the snap-on type shown above. 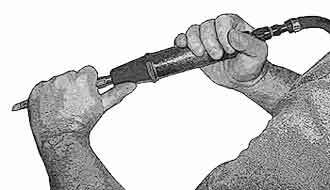 For those carvers who work in a small scale or in need the flexibility of a small tool to get into tight areas there is made a small pneumatic carving hammer — sometimes called a pneumatic pen — that can be held in one hand much like a writing pen, though using it with two hands will allow a greater degree of control. The example pictured is an Italian design, though there are similar designs made by American manufacturers.